The top-ranked light heavyweight in the world cemented his place in line for a shot at the title Saturday night, as Anthony “Rumble” Johnson scored a devastating 13-second knockout of No. 2-ranked Glover Teixeira in the UFC 202 co-main event at T-Mobile Arena in Las Vegas. That has been more evident than ever in the Georgia native’s second stint in the UFC, as the 32-year-old has gone 6-1 with five knockouts, with his only loss coming against current champion Daniel Cormier in May of 2015. Now Johnson awaits a second crack at the crown, and he made his case emphatically against the iron-chinned Teixeira, who had not been stopped since 2002. 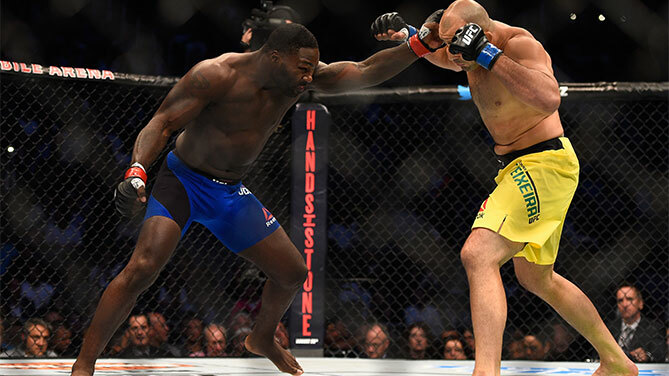 After the two fighters touched gloves, they engaged, and Johnson struck immediately, with a right uppercut all it took to put Teixeira on the canvas. Referee Dan Miragliotta jumped right in to stop the bout, making it the third-fastest in UFC light heavyweight history. Johnson moves to 22-5 with the win; Teixeira falls to 25-5. Former lightweight title challenger Donald “Cowboy” Cerrone made it three wins and three finishes at 170 pounds, as he impressively halted Rick Story in the second round. The win, Cerrone’s 18th in the Octagon, tied him with Hall of Famer Matt Hughes for third most in UFC history, but following the bout, “Cowboy” was calling for a return to lightweight and a rematch against new champion Eddie Alvarez. Surprisingly, it was Cerrone putting the wrestler on the mat in the opening minute, but Story got loose, and once on his feet, he bulled his opponent into the fence before getting his own takedown. 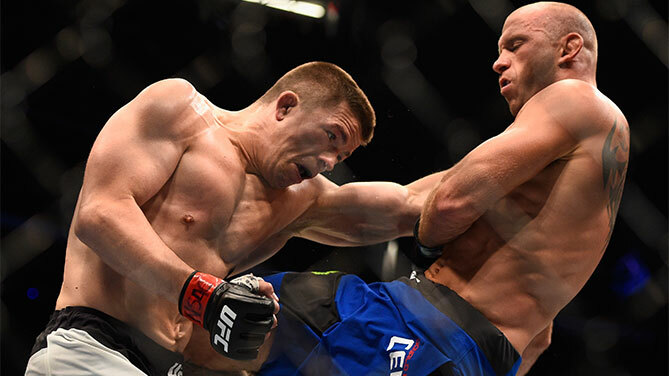 Cerrone immediately sought a submission, and when that didn’t happen, he escaped to his feet, where he was able to score effectively with kicks to the body and legs as well as punches upstairs. Keeping it standing in round two, Cerrone continued to peck away at Story, but then he caught the Vancouver native napping as he landed a beautiful combination that included a right punch to the body, a left punch to the head and a right kick to the head that hurt Story and spun him around. Story tried to recover, but Cerrone wasn’t having it, with a barrage of shots putting him down and out, as referee Herb Dean stopped the fight at 2:02 of the second stanza. The No. 14-ranked Cerrone improves to 31-7 with 1 NC; the No. 9-ranked Story falls to 19-9. 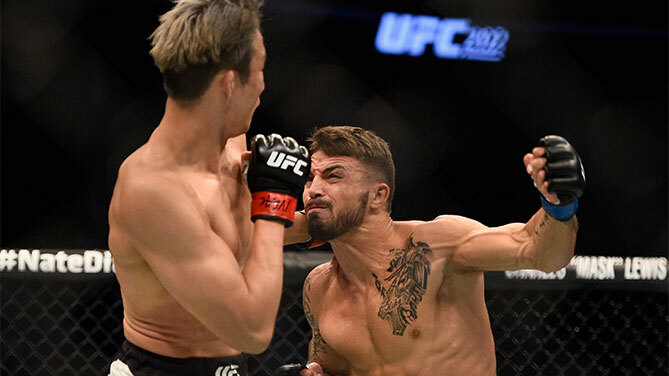 Unbeaten welterweight newcomer kept his perfect record intact in his Octagon debut, knocking out South Korean veteran Hyun Gyu Lim in the first round. Looking to be facing a rough night thanks to a huge size disadvantage, Perry took a little while to find his range, but once he did, “Platinum” began teeing off, scoring three knockdowns before referee John McCarthy called a halt to the bout at the 3:38 mark. Perry moves to 8-0 with the win; Lim falls to 13-6-1. 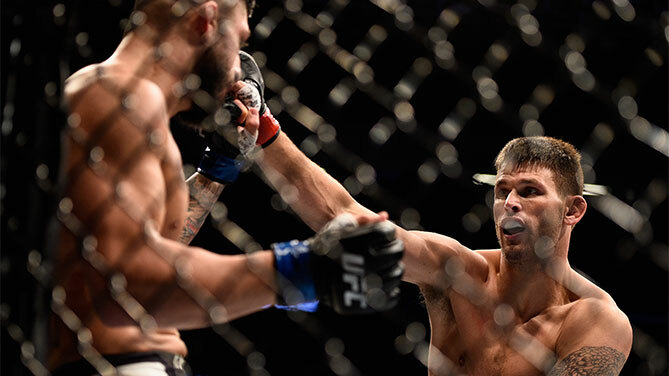 Welterweight veteran Tim Means was apparently unbothered by a late change of opponents, as he battered, then finished, Sabah Homasi in the second round of the main card opener. Homasi, who replaced the injured Sean Strickland on August 5, had some success with his grappling in the opening round, but as the seconds ticked by, Means began dominating, landing several hard strikes, including an elbow that opened up the Floridian’s forehead. Things didn’t get much better for Homasi in round two, as New Mexico’s Means patiently continued drilling his foe with a steady assault of punches and elbows, and after a spell of this, referee Herb Dean had seen enough, stopping the bout at 2:56 of the second frame. With the win, Means moves to 26-7-1; Homasi falls to 11-6.